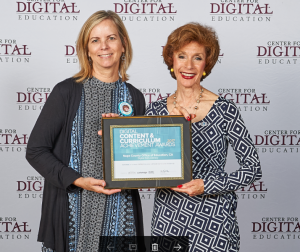 The Center for Digital Education 2017 Digital Content and Curriculum Achievement Awards recognized the ground-breaking work by small, medium and large school districts. Dr. Barbara Nemko, Superintendent of Napa County, received one of these coveted awards for her DEL (Digital Early Literacy) program. Core to this program is the Footsteps2Brilliance mobile early literacy apps. The preschool student population in California’s Napa County is 88 percent Spanish-speaking. When these children reach kindergarten, the achievement gap is two to three years, and that gap persists throughout their entire school career. In 2010, Napa County Superintendent of Schools Barbara Nemko’s granddaughter, 2 years old at the time, discovered the app Footsteps2Brilliance. Watching the toddler focus on the app, Nemko knew she was on to something. Her granddaughter listened to stories on the app and would ask to listen over and over again. Nemko realized the app had the potential to give Napa’s at-risk preschoolers the same early reading experience almost all middle- and higher-income students get at home. The district began offering summer camps to pre-kindergarten children. It also provided kindergarten teachers, who were skeptical at first, a stipend to spend time learning the app. It didn’t take long for students and teachers alike to see the benefits of the app, which includes nursery rhymes and fables, as well as a huge teacher resource section. There was also an unexpected side effect — the Spanish-speaking parents of children using the app reported that their English improved right along with the skills of their children. In 2014, the district decided it wasn’t enough for preschool students to have iPads at school, they needed them at home too. Through a grant from Napa Learns, a local partner, the district provides iPads for low or no cost to preschool families.